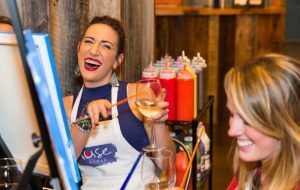 Muse Paintbar will open at 11943 Democracy Drive in the winter, according to a company representative. The target opening date for the wine-and-paint studio, which will have a 3,000-square-foot storefront, was originally set for the fall. The store will host painting sessions daily at its locations. The Reston Town Center location will be one of more than two dozen locations along the East Coast. It takes the place of The Bike, which recently reopened at 11150 Sunset Hills Road. No further details were available on the exact opening date.